Pressure-treated wood is soaked in chemicals and is often still wet when delivered to the lumber yard. Depending on how long the wood sat on the lumber yard racks, it may still have been somewhat wet when purchased and used to build your new deck. Pressure-treated decks can't always be painted right away, but there are some steps you can take to protect and beautify it until it's time to paint. Until 2003, pressure-treated wood was soaked in chromated copper arsenate (CCA). Due to concerns about the safety of CCA--which contains arsenic as well as heavy metal copper--the lumber industry voluntarily stopped using it. Currently the primary preservatives used are amine copper quat (ACQ) and copper azone (CA). Pentachlorophenol is another chemical used for preserving wood and inhibiting pest damage. Pressure-treated wood is used primarily for decks, fences, foundations and any other application where the wood is close to, or buried under, the soil. There are several different grades of pressure-treated wood, and different chemicals used. The standard advice is to apply a clear sealer, then allow the deck to weather for a year or two to allow the chemicals to evaporate. The USDA Forestry Service Forest Products Laboratory recommends waiting for two years before painting or staining pressure-treated wood. Some lumber suppliers allow the wood to cure in their warehouses before sending it to retailers so the wood may be painted or stained immediately. Ask at the lumber yard or call the lumber supplier for their recommendation. Home Depot suggests it can be painted or stained as soon as a cup of water poured onto dry wood soaks in instead of beading up. A marine-grade oil-based deck paint will hold up the longest for exterior pressure-treated decks, although any good-quality deck paint should give you at least a year or two of use before peeling, depending on the type of exposure and traffic the deck gets. Pressure-treated deck wood should always be primed. Use either a latex oil or oil-based primer--either will work, regardless of your finish paint. Your geographic location will in part determine the best paint. A seaside deck in the Northeast that is exposed to temperature extremes and saltwater may require a different paint than a deck in the hot, dry Southwest. For the best recommendation, go to a real paint store instead of a chain home center and let them guide you. Over time, painted decks usually cost more to maintain. Both need frequent coating reapplication. Restaining is not a difficult job. It simply requires washing a worn-looking deck, letting it dry and applying another single coat of stain. However, paint peels, which can mean hours of work scraping it up. Bare wood needs to be primed before painting. Over the years, there will be a considerable buildup of paint on the deck, and each successive repainting job will take longer. 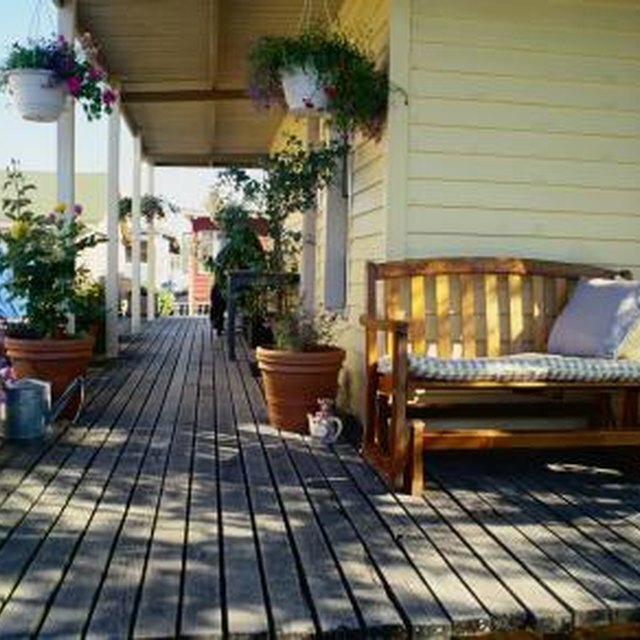 Painted decks can look beautiful. Just be sure you're ready for the extra upkeep.